Tuff enough: Freshman Riley Battin is a big part of the Utes’ future, and living in a backyard shed showed his selfless side. ‘Whatever it is, he’ll adapt and find a way,’ Battin’s longtime basketball teammate says. (Trent Nelson | The Salt Lake Tribune) Utah Utes forward Riley Battin (21) shoots a three-pointer as the Utah Utes host the Oregon Ducks, NCAA basketball in Salt Lake City on Thursday Jan. 31, 2019. Even his life in the Tuff Shed was comfortable. The storage facility, placed in the family’s backyard and renovated with insulation, drywall, a closet and a portable heater and air conditioner, became Riley’s Room throughout high school. His makeshift housing facilitated the move from Ohio of his grandmother, now 98, into the three-bedroom home with Battin’s parents and younger sister in Westlake Village, Calif.
Friends kidded him about preparing for college, moving 15 feet from the backdoor, while having to come inside to eat and use the bathroom (“We knew we'd see him,” said his father, Lee). (Photo courtesy of Lee Battin) Utah basketball player Riley Battin lived in this converted Tuff Shed in the backyard during high school, so that his grandmother could have a bedroom in the family's home in Westlake Village, Calif.
Unselfishness may be Battin’s biggest problem on the court, as his freshman season continues with Saturday’s game at UCLA, 30 miles from his home. In the Oak Park High School community, he’s remembered as Ventura County’s all-time leading scorer and for having bonded with a 10-year-old boy who loved being around the Eagles, while dealing with sickle cell anemia. Luc Bodden died in September 2016, at the start of Battin’s junior year. Riley “holds that kid dear to his heart, to this day,” Lee Battin said, remembering how his son arranged to have a framed photo of Luc propped next to the team bench during pregame introductions. That attitude is being tested at times, as Battin blends in with the Utes. He became a starting forward in late December, as Donnie Tillman moved to the bench. Battin has stayed in the lineup, even though Tillman is more productive. The 6-foot-9 Battin made basketball look easy at Oak Park, scoring 2,971 points in four years. That was an illusion, and he hopes the traits that made him successful in high school will help him thrive at Utah. “I’ve had to work really hard for everything that I’ve gotten in my life and I’m going to continue to do that,” he said recently, interrupting his post-practice shooting session. (Photo courtesy of Lee Battin) University of Utah basketball player Riley Battin (second from left), is shown as an Oak Park High School player, waiting to be announced as a starter before a game. The framed photo at the end of the bench is of Luc Bodden, an Oak Park fan who died at age 10. Battin asked that the photo of Luc become part of Oak Park's pregame introductions. Battin compiled a list of questions for college recruiters. No. 1 was whether he would have 24-hour access to the gym. Battin’s style of play at Oak Park was “completely unselfish,” Shaw said, yet the Eagles needed him to score. At Utah, for all of his extra shooting practice, he tends to pass up too many shots in game. Ute coach Larry Krystkowiak this week spoke of “a little uncertainty” shown by Battin, who’s averaging 21.5 minutes and 6.7 points (4.7 in Pac-12 play), and said he needed to play harder. Battin was more assertive in Wednesday’s 77-70 win at USC, posting nine points and seven rebounds. Battin is valuable to the Utes now and equally vital to the perception of Utah’s future. He’s part of the geographically diverse, position-balanced freshman class of 2018. Those five players will be charged with lifting a program that’s almost certain to miss the NCAA Tournament for a third straight year. Timmy Allen already is a proven player. Both Gach, while inconsistent, is extremely athletic. Naseem Gaskin and Lahat Thioune, who broke his foot in October, are redshirting. That makes Battin the biggest variable, at the moment. The related question is whether all five will stick together, in a program beset by transfers. His grandmother, Marian Battin, is likely to see Riley complete his college career (“She'll easily live past 100,” Lee Battin said). The forecast for the Utes hinges partly on how they finish in 2018-19, with their 12-10 record (6-4 Pac-12) making a winning season possible. Utah will seek a weekend sweep at UCLA, where Battin's young friend spent considerable time in the Mattel Children's Hospital. Luc Bodden once served as the “Kid Captain” for a Bruins football game during his treatment. Battin will be thinking of him Saturday, returning to the campus where he often visited him. The Boddens and former Oak Park athletes who knew Luc compose “a whole, big, extended family,” Slajchert said, and they’ll all be cheering for the Utes in Battin’s homecoming game Saturday. Hometown • Westlake Village, Calif.
High school • Oak Park; averaged 24.7 points and 12.3 rebounds as a junior and 25.7 points and 12.4 rebounds as a senior. Of note • Born in August 1998, he’s more than two years older than Dre’Una Edwards, a starting forward for the Utah women’s basketball team. A good student, he repeated a grade for “family reasons” not related to sports, his father said. Records • Utah 12-10 (6-4 Pac-12); UCLA 12-11 (5-5 Pac-12). Series history • UCLA leads, 10-8. About the Utes • After some upsets this week, Utah is in a four-way tie for second place in the Pac-12 – yet is only two games ahead of 10th-place Colorado. 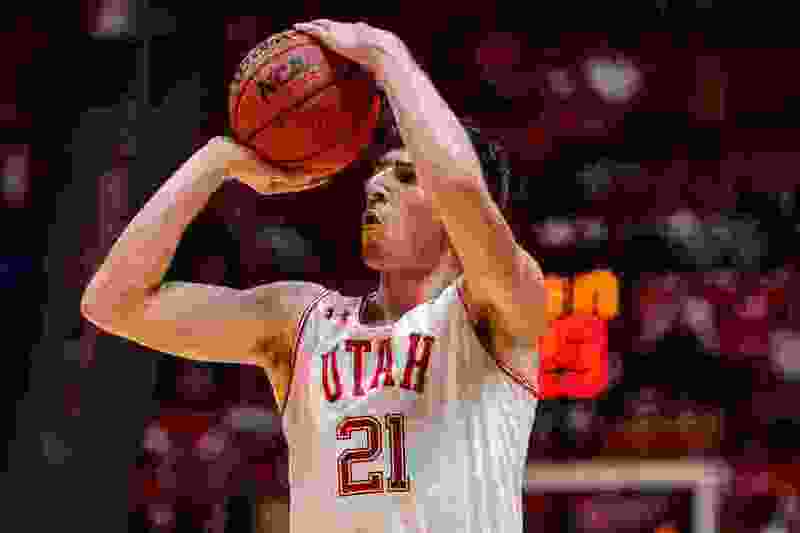 … Utah is 4-1 on the road in league play after Wednesday’s 77-70 win at USC and is going for a road sweep of the conference’s four California schools. … The Utes lost by 19 points in Los Angeles last season before winning by six at the Huntsman Center. … Junior center Jayce Johnson posted 13 points and 13 rebounds at USC. About the Bruins • UCLA has dropped four home games this season, including an 84-73 loss to Colorado on Wednesday with season-low announced attendance of 6,983. … Colorado’s Shane Gatling scored 28 points against the Bruins, hitting 7 of 9 shots from 3-point range. … Freshman center Moses Brown posted 17 points and 10 rebounds for UCLA. … Murry Bartow became UCLA’s interim coach in early January after Steve Alford was fired.